This is the night before our Family Art Show. We have really worked hard getting ready for this one. It can be stressfull doing a show but it is also exciting. Something happens to our house when we fill it with art and take time to arrange everything. It is a little like what the kitchen feels like when you come home from the farmer's market and you have heaps of fresh fruit and vegtables laying on the counter. 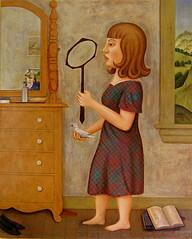 The painting of the girl holding a mirror in one hand and a bird in the other is one of the new pieces that you will see if you stop by this weekend. You might wonder why she is holding a bird and a mirror. What is the connection? I like a picture to be haunting. When listen to a Leonard Cohen song. They hang around in with you a long time because of the way the songs make sense in your heart but not really in your head. Some times art works better when there are a few things "wrong". Have you ever noticed that just before you embark on an important event you are assailed by all kinds of fears of possible failure. I have this alot. I can feel it wanting to grind away at me tonight. I am choosing to be hopefull tonight and in the words of my wife Brenda's hooked rug, I am "Expecting Good Things".